Is The S&P Carving Out a Super-Sized Major Top? Are stocks in the late stages of a bull market rally, in a bear market rally, rolling over, or getting ready for another leg up? Regardless of the actual state, the conclusion and outlook seems to be basically the same. Are we in a bull market, bear market, or go nowhere market? I guess we can all agree that we are in a rigged market, but that doesn’t answer the question. A bit more research may help though. According to Lowry’s, bull markets historically last an average of 39 months. Assuming that the March 2009 low at S&P 666 was the beginning of a new bull market, it was 37 months old at its April high of 1,422. If that bull is still alive, it’s 40 months old today. The bull is old and gray (perhaps already bald). Although the S&P gained 113% from March 2009 – April 2012, there’s one problem with categorizing the rally from the March 2009 low as a bull market. Since 1940 no bull market has ever experienced more than one decline of 10% or more. The alleged post 2009 bull saw two major declines. One in 2010 (-17%) and another in 2011 (-21%). Make it three (-11% from April – June 2012) if you consider the bull is still alive. Statistically (using the commonly accepted 20% decline equals bear market rule) the 2011 decline was actually deep enough to usher in a new bear market, but we know that’s nonsense because the S&P, Dow Jones, Nasdaq and other broad indexes completely recovered their losses. How about this for an explanation? A new bear market started in 2007 and has been in force ever since. All the rallies we’ve seen since then have been counter trend or bear market rallies. Obviously, this 3-year rally is not your average garden-variety rally either. In hindsight, the character of seemingly ever rising prices makes sense. After all, the world’s central banks have spent trillions of dollars propping up stocks. In the middle of May I wrote about the timing component of the topping process and noted the time it took to carve out the 2007 top (about 9 months) and the 2011 top (about 6 months). Based purely on timing, stocks shouldn’t have been ready to fall hard without looking back in May. Today the picture looks a bit different. Stocks popped, topped, and dropped but 5 months later the S&P 500 (SPY) is still hanging around in the mid 1,300s. Based on timing, selling pressure could accelerate from now on. 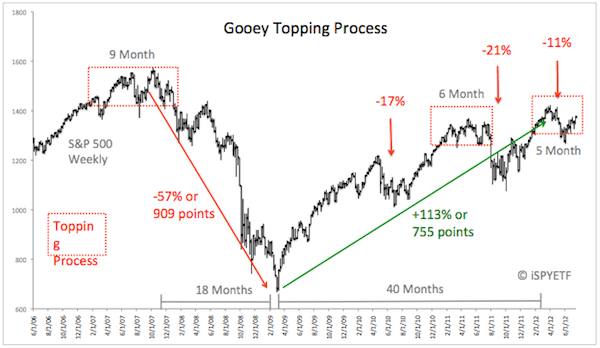 The chart below frames the 2009 and 2011 topping processes and highlights the 17%, 21% (and 11%) “bull market” declines. But there’s much more to this chart. The October 2007 – March 2009 decline erased 909 S&P points within 18 months (50.5 point per month). The ensuing rally is now 40 months old but has recovered only 755 points (19 points per month). Declines have been swift and sudden, while rallies have been drawn out and gooey with much sideways churning in between. Regardless of whether the rally from the March 2009 lows is considered a new bull market or a bear market rally, it is already over or close to being over. Odds are when the bear comes back it will be fast and furious once again. The Approaching Ultimate Bear Market Signal – Is it as Scary as it Sounds? A long-term S&P 500 moving average crossover is about to trigger the first sell signal in 73 years. What does this mean for stocks and investors? Certain events – like the 2008 market crash – are once in a lifetime experiences for investors. Unfortunatly, we might be in for a double whammy. 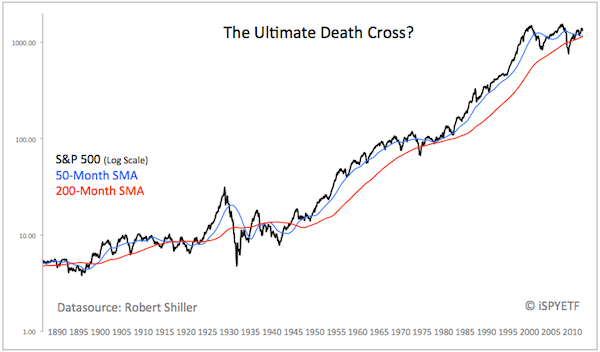 The S&P 500 (SPY) is about to get hit by the ultimate sell signal, some have dubbed it the “ultimate death cross” (UDC). A death cross is when the 50 period moving average drops below the 200 period moving average. A golden cross (exactly the opposite) occurs when the 50 moving average moves above the 200 moving average. We’ve seen various golden and death crosses – 12 since the beginning of 2000 to be exact – based on daily moving averages. But now the S&P’s 50-month moving average is threatening to fall below the 200-month moving average (the two averages are about 7 points apart). The chart below provides a visual of the SMA crossover. The 50-month, 200-month crossover is a rare occasion, which means that the sample size to base any conclusions on is small. The chart below shows the S&P since 1887 (datasource: Robert Shiller). The last monthly 50/200 SMA crossover was 66 years ago in April 1946. This was a bullish crossover or golden cross and the S&P has rallied from 19 points to as high as 1,576 since. Not bad for a long-term buy signal. 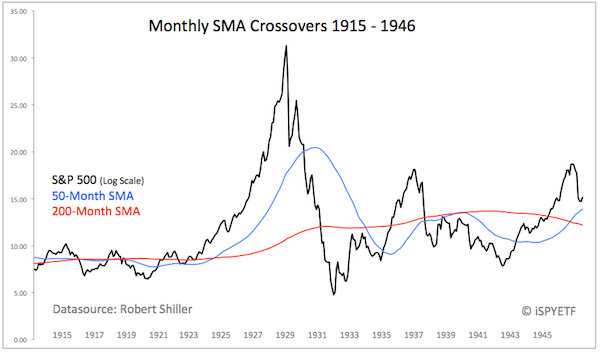 The third chart zooms in on 1915 – 1946, the time frame that hosts the last cluster of monthly SMA crossovers. The most recent UDC triggered in August 1939 (73 years ago), but was quickly reversed by a golden cross six months later. The last clean UDC happened May 1934. It preceded a 10% decline followed by a 100% rally. A golden cross in 1925 correctly foreshadowed the 300+% bull market ahead of the Great Depression. From 1915 – 1925 the 50 and 200-month SMA traded very close to each other with no significant signals. Like any SMA crossover, the UDC is a lagging indicator. Looking at the trajectory of the 50-month SMA, the UDC may not trigger until late 2012. The great bull market of the 20th century topped in 2007. The UDC sell signal will be about five years late but may come just in time to warn us of the second bear market leg. Regardless of its spotty track record, the UDC emphasizes that we’re living in unique times and its long-term message agrees with the big picture bearish outlook painted by my indicators. Why do stocks typically outperform short-term government bonds? It’s a question of risk and reward. Brand new research from the New York Fed shows that the Federal Open Market Committee (FOMC) is the cause for a 55% overvaluation of the S&P 500. Conspiracy theories are fun, but unfortunately they are often just that – theories – grown on the fertile soil of biased bloggers, journalists, or conspiracy groups. Here’s a super enlightening piece of research published right on the website of the Federal Reserve Bank of New York. It comes straight from the horses mouth so to speak and tackles a very controversial subject. The research talks about the equity premium. The equity premium is usually measured as the difference between the average return of the stock market and the yield on short-term government bonds (corresponding ETF: iShares Barclays 1-3 Year Treasury Bond ETF, SHY). Analysts agree that the return of stocks should be greater than that of bonds to compensate for the volatility of stocks. However, analysts can’t agree on the reason why the return of stocks is greater than that of short-term government bonds and what the return margin between stocks and government bonds should be to compensate for the extra risk linked to owning stocks. – This return is earned ahead of the announcement, so it is not related to the immediate realization of monetary policy actions. The chart shows average cumulative returns on the S&P 500 stock market index (related ETF: S&P 500 SDRS – SPY) over different three-day windows. The solid black line (the chart is not as clear as it should be, but it’s taken directly from Lucca and Moench’s research) displays the average cumulative return starting at the market’s opening on the day before each scheduled FOMC announcement to the market’s close on the day after each announcement. The dashed black line (at the bottom), which represents the average cumulative return over all other three-day windows, shows that returns hover around zero. This implies that since 1994, returns are essentially flat if the three-day windows around scheduled FOMC announcement days are excluded. What does that mean? Let’s take a look at another chart to visualize the effect of the pre-FOMC announcement spike. The chart below shows the S&P 500 (SPY) in blue and red. The blue line is the actual S&P 500 performance, the red line (that’s where it gets interesting) is where the S&P would be if you exclude the returns on all 2 pm – 2 pm windows ahead of the FOMC announcement. Excluding those returns the S&P would trade around 600, 55% below current prices. The original article published on the New York Fed’s website can be found here. There’s much talk about QE3. What would QE3 do for stocks and the economy? Since 2007 the Federal Reserve and European Central Bank (ECB) spent about $3.5 trillion on various stimulus packages. This has kept the S&P 500 afloat while economic activity is deteriorating. We are all familiar with the term “house of cards” and its implication. For illustration purposes, let’s assume we’re dealing with a number of card houses. What’s curious is that most of them are falling apart while one of them is still standing. This house of cards is not separated from the others or protected by a draft, but it keeps standing as if it’s best buds with a glue gun. My wife isn’t the only one to like her glue gun, central banks around the world, particularly the Federal Reserve and European Central Bank (ECB), love their (glue) guns and they’re sticking to them. In fact, their glue gun – printing money – has become a sort of addiction. Without “sniffing glue,” the economies just can’t survive. How do we know that? Now would be a good time to pull out some charts and data. The chart below compares the performance of the S&P 500 (SPY) with economic activity and the balance sheets of the Federal Reserve and ECB. Rather than listing economic activity individually, the chart shows the Weekly Leading Index (WLI) published by the Economic Cycle Research Institute (ECRI). The ECRI WLI is a proprietary index that combines multiple data points including unemployment, CPI, PPI, mortgage applications, etc. The chart is almost self-explanatory, but let’s just highlight the obvious anomalies. The S&P has been going up (green arrow). The ECRI WLI – meaning broad economic activity – has been going down. Why? The balance sheets (glue guns) of the Federal Reserve and ECB glued the system together when it was falling apart. The ECB’s liabilities are close to $4 trillion, the Federal Reserves’ about $2.6 trillion. The stock market thus far is enamored by the glue gun approach, but the economy’s saying that the glue gun isn’t working. Something’s gotta give. I think it will be the stock market. The Dow – The Most Popular and Most Flawed Index in the World? Trick question: Is the Dow Jones Industrial Average (tracked by the Dow Diamonds ETF – DIA) the most widely recognized stock market index in the world? No, technically it isn’t. Here’s why and what makes the Dow the most flawed “index” on Wall Street. You know what else is charming? The Dow Jones Industrial Average (DJIA). The Dow is the dinosaur among market indexes in more ways than just longevity. Unlike other market cap weighted indexes like the S&P 500, Russell 1000 and Nasdaq, the Dow is price weighted. It should therefore be considered an average not an index. The value of the DJIA could literally be calculated with just pen and paper by adding up the share prices of its components and multiplying the sum by 7.58 (or dividing the sum by 0.132). 7.58 (or 0.132) is the divisor used to keep the DJIA value constant. Component stocks being price weighted means that the company with the highest stock price is the VIP. With a price tag of 191 that’s IBM. In fact, IBM is priced so much higher than its fellow Dow component stocks that it dominates the Dow’s performance with an 11.5% weighting. To illustrate, let’s compare IBM with the Dow’s smallest component – Bank of America (BAC). Earlier this year BAC gained as much at 81%. This impressive gain added a whole 35 points to the Dow’s performance. The same gain in IBM would have propelled the Dow by 1,130 points. The top five price weighted DJIA stocks account for about 34% of the index, while the bottom five have a combined 5% weighting. The same top five stocks account for only 18% of the market cap while the bottom five account for 11%. IBM has about 10 times the weighting of GE but only about 25% more market capitalization. The chart below makes it easy to dig up more anomalies (if you so choose). The chart shows the Dow’s components sorted by their price weighting (blue columns) contrasted by their market cap weight (dotted black column). The Dow’s performance is pretty much in line with that of the S&P or Russell 1000, so what’s the fuss about the Dow’s anomalies? Investors should be aware of any one stock dominating an index they own. IBM makes up 11.5% of the Dow and Apple accounts for 20% of the Nasdaq-100. If you own any of those lopsided indexes you should watch its key components more than just peripherally. There will be a time when a major component will provide a strong buy or sell signal and odds are the index will move in the same direction as its alpha male. If your goal is to assemble a balanced portfolio, there’s no need to own the Dow Diamonds (DIA) and IBM shares, or the Nasdaq (QQQ) and Apple shares. And even if any of the above information doesn’t affect you or your style of investing/trading at all, you’ve just learned something that probably fewer than 1 out of 10 investors know. Farmers are dependent on weather to grow their crop. Decades of watching weather patterns have resulted in folk wisdom such as quoted above. Decades of watching stock market performance has yielded Wall Street folk wisdom (if you can use Wall Street and wisdom in one sentence) like: “Sell in May and go away,” “Santa Claus Rally,” “January Barometer” and others. Seasonality does for market forecasters what weather patterns do for farmers and meteorologists. They are valuable but not infallible. This article will take a look at how the S&P 500 (SPY) has conformed to seasonal patterns thus far in 2012 and what the seasonal biases are for the rest of the year. Before we look at seasonal biases, it’s good to point out that since 1950, the S&P (SPY) was up 46 out of 62 years (74%). Since 1970, the S&P (SPY) was up 32 out of 42 years (76%). Therefore, averaged over decades, even seasonal rough spots like February, May, and September are reduced to average monthly losses of no more than half a percent. The first chart plots the S&P 500 (SPY) against seasonality. The underlying data for seasonality is the average monthly performance of the S&P since 1950. We see that “sell in May and go away” proved to be the right move, although the May correction was more pronounced than seasonal weakness suggested. Aside from perhaps a small summer rally (which may have come early in June), seasonality suggests soft prices until October followed by a year-end rally. The second chart adds a twist to the generic seasonal pattern; it illustrates the S&P’s performance during election years. One difference that makes election year seasonality stand out is a stronger than usual June – August period and a much weaker October (the weak October is largely due to the 16.9% loss in October 2008). September is the weak link in both patterns. Others live (and die) by seasonal patterns. The right approach lies somewhere in between. Seasonality for the remainder of the year suggests soft prices (but no big decline) in July and weakness going into September/October followed by a strong year-end rally. High probability trading opportunities are ideally confirmed by seasonality (such as the May 2011 sell and October 2011 buy signal), but sometimes other market forces (sentiment, technicals, money flow) simply overpower seasonal biases. Rather than focusing on one indicator, the Profit Radar Report takes a multi-dimensional approach to trading, which includes technicals, sentiment, seasonality, cash flow, fundamentals and yes, seasonal patterns. About 168 million shares of the SPDR S&P 500 ETF (SPY) exchange hands every day. SPY is the largest and most actively traded ETF in the world. More than 35 million shares of short and/or leveraged S&P 500 ETFs are traded every day. This includes the UltraShort S&P 500 ProShares (SDS) and Ultra S&P 500 ProShares (SSO). The iShares Russell 2000 Index ETF (IWM) has a 3-month average trading volume of 54 million. The two triple leveraged Russell 2000 ETFs – Direxion Daily Small Cap Bear 3x Shares (TZA) and Direxion Daily Small Cap Bull 3x Shares (TNA) – have a trading volume of 37 million shares. Obviously short and leveraged ETFs resonate with investors, but there are risks everyone needs to be aware of before hitting the “buy” or “sell” button. Short (leveraged) ETFs attempt to deliver 1x, 2x or 3x the inverse performance of the underlying index. To deliver inverse performance, ETF providers use instruments like swap agreements, futures and options. Unlike the S&P 500 SPDR ETF (SPY), which completely replicates the underlying index by owning all components, short (leveraged) ETFs can only attempt to duplicate the daily performance of the underlying index by using alternate financial instruments. To illustrate, imagine describing a person using a picture compared to a drawing. While a drawing resembles the original, it will never be as accurate as a picture of the original. The difference between the picture and drawing is the tracking error, which may be to your advantage or disadvantage, more often than not it results in price deterioration. The best way to illustrate the tracking error of leveraged (short) ETFs is via a few simplified examples. Assuming that you are betting on the right direction, trending markets tend to enhance the return of leveraged ETFs, while range bound markets are the worst possible environment. The chart below plots the price of the S&P 500 against the price of the UltraShort S&P 500 ProShares (SDS), a 2x leveraged short ETF. The S&P closed almost at identical prices on May 2, 2011 and February 21, 2012. SDS lost 18% over the same period of time. Driving 150 MPH on the Autobahn is fun, but comes with added risk. There’s no way to eliminate the extra risk. The best you can do is limit the risk. 1) Picking your spots: Only buy or sell when there’s a high probability, low-risk entry. 2) Money management: Lock in profits against major support/resistance levels and don’t hold positions for too long. Stick to your stop-loss levels. The Profit Radar Report’s mission is to spot high probability, low-risk opportunities. Low-risk means that the risk of losing is well defined and much smaller than the potential for gains.